Unity, what does it mean to Cockney Nutjob and Kurnel MC? Unit E was the ward Kurnel MC was put in after he broke his elbow raving. Unity is the undivided togetherness Cockney Nutjob feels while caressing a cheese burger at a festival. Either way, we can agree it means coming together as one. Which is what’s happened on this historic slab of good times for your ear holes. Unity by Kurnel MC and Cockney NutJob. Unity - The title joint and a true pace setter for the project. Picture yourself in a festival tent, five wines too many, hazy from the jazz fag some one recently passed to you. Jumping up and down high fiving homies to the militant reggae stomp accompanied by belly shaking bass while Kurnel keeps your hands in the air! Drenched - we remain on the party vibe and the consistent reggae sampled, synth bass back drop. The boys ensure you have your togs on and are willing to let all your hairs hang out in the deep end while they provide entertainment and keep on the wrong side of the lifeguard. Parents anthem - Right it’s out the pool and on the piss. Both the lads are family men and have escaped for the night. They have more than one thing in their sights. Grog, late night mystery meat from abra-kebabra and some questionable Dad dancing. Either way this slab of audio doner meat is a theme all parents can get down to! Get it - Finishing the package on a high. Continuing the theme of reggae and wobbles that distinguishes these two gentlemen. Kurnel points out that even if it’s sleep for dinner and the electrics packed in. As long as you have good friends, good vibes and dope music the rest will fall into place. Well, it looks like that scurvy sea dog Pecoe is up to his old tricks again. This time he’s taken to the high seas with his pump action funk chucker. Leaving behind his beloved forest of funk, the man’s gone AWOL and he’s only hi-jacked a fishing Vessel fitted with speakers and a glitter ball on the bottom! Currently he’s making his way through the Great Barrier Reef and grappling the helm in his Ninja Turtle board shorts. What’s his plan? Bringing new life to the once colourful corals with his signature big drummed, funk fuelled smashers! He’s been drinking Bacardi for 10 days straight. His cats have scuba gear on and are currently performing the Macarena to an unlikely crowd of Sea Gulls. What could possibly go wrong? So, let’s get started replenishing the reefs with the power of The Vibe Vessel! First up is “Kick it Fresh!” A delicious cut of uplifting funk, that slides unsuspectingly into synth growls and stabs that will bring smiles to thousands of species of fish. Currently pissed off at humans for ruining their once beautiful home hopefully this will cheer them up! Now it’s time to move onto the Sting rays. Rumour has it they have a soft spot for classic funk and Quentin Tarantino flicks. As always Papa Pecoe has the remedy. Swooping in with “Jungle Hoodie” a solid portion of familiarity, coupled with different styles and energies to give the aquatic dance floors what they’re craving! What’s this? There is life appearing? I thought he was cuckoo but Pecoe must be onto something! Let’s keep with the funk flavour and slam our foot on the accelerator as we slip into “That’s the Funk”. He Borrows Bootsy’s formula while adding several ingredients of his own, bringing a feel-good dance floor smasher to the masses of marine life! These seas are certainly on the road to repair thanks to this treasure chest full of bangers! 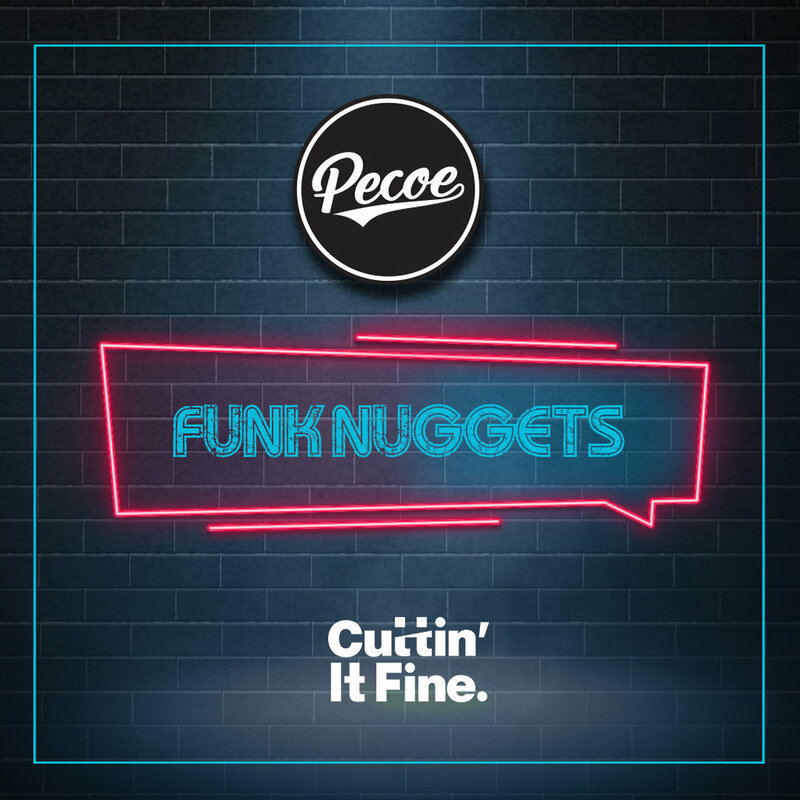 Last, but certainly not least Pecoe takes us by surprise with what can only be described as end of level boss music with “Open Up Your Mind” A 122 Bpm stomper that will leave sea cucumber crowds screaming for more in 2019! Well that was quite a spectacle Pecoe, the boat is pumping, the Bacardi bottle is empty and the felines have sun stroke. Time to make a visit inland me thinks…. Until next time landlubbers, remember look after the ocean or Papa Pecoe will be after you! Come one come all to the Cuttin’ It Fine Christmas party! Not one to be stingy this time of year, we welcome 2 new members to the team and deliver a sizzling EP full of Bass, Blends, Disco and Funk! But where are my manners? Let’s introduce the new members of our crew! First up to bat is our Irish, Edinburgh based bad man on the buttons. It’s Gramophone Soul! We welcome him to the team and have already heard drafts of his debut EP, which is nothing but exceptional. Well, don’t just stand there man! Just because your new doesn’t mean you can turn up empty handed. Pat him down Pecoe, what’s he got in his pockets? Ah, an edit of “Diana Ross - Coming out” Not just yet…Back in your cage and get to work on your EP. Next up… Hipsta managed to tempt this young man in with some sweaty Werther’s originals. We welcome Mr. Fitz to the fold! He will be joining the ranks and dropping a fist pumping four tracks with us. So far, he’s recruited Hypeman sage and many more. Expect a splice of Hip Hop, Drum and bass and general wobbly goodness from this young man. Now, what have you got? Ah, there’s a good chap. A nicely wrapped version of “Van Morrison’s Brown Eyed Girl” with some Drum and Bass skank injected? Very good lad. Back in the crate and continue working on your release. What’s that? The rest of them are fidgeting with their offerings and possibly getting jealous of the new boy’s. Who’s next? Ahhh, the Funk lover himself. Sir Frankee More. He’s made a journey to rival the three kings from Sydney, just to deliver some bandicoot chutney and this edit of “Jungle Happy man!” Of course, injected with that unmistakable Frankee bass thump! Well done my lad. Have a chocolate coin and go back to the motherland. Who else do we have in here? It’s Hipsta! One of the original signings to CIF. It’s about time you started pulling your weight, what gifts do you have? Oh, I say! A “Beastie Boys - Body Movin” edit they’ll be no body moving after the CIF turkey and trimmings have been devoured. However, I thank you for this splendid funk fueled re-edit of a timeless classic. You’ve done it justice good sir, now go forth and get your fingers out of Frankees chutney!! Last but not least dressed in a delicious Egyptian tunic and aviators to match. It’s our very own funk prospector Pecoe. He was hiding in Frankee’s afro wig. Wonderful to see you, I hope you’re not empty handed? What a wonderful treat! A deliciously crafted edit of the soul queen “Etta James - Fire” It certainly is…I have a sneaky feeling this will be getting a lot of air play over the yule tide season and New year. Blessings brother Pecoe, we’ll see you next year for your second EP. Well that wraps it up! We hope you enjoy this medley of our producers’ secret weapons and edits. This is a gift from all of us at Cuttin’ It Fine to thank you for your support. We’ve only been here for 5 months yet have had such great support and feedback from you all. Merry Christmas and see you in the new year for back to back releases! B-Side, El Bomba, Cockney Nutjob (Honorary Southerner) & label boss Roast Beatz. 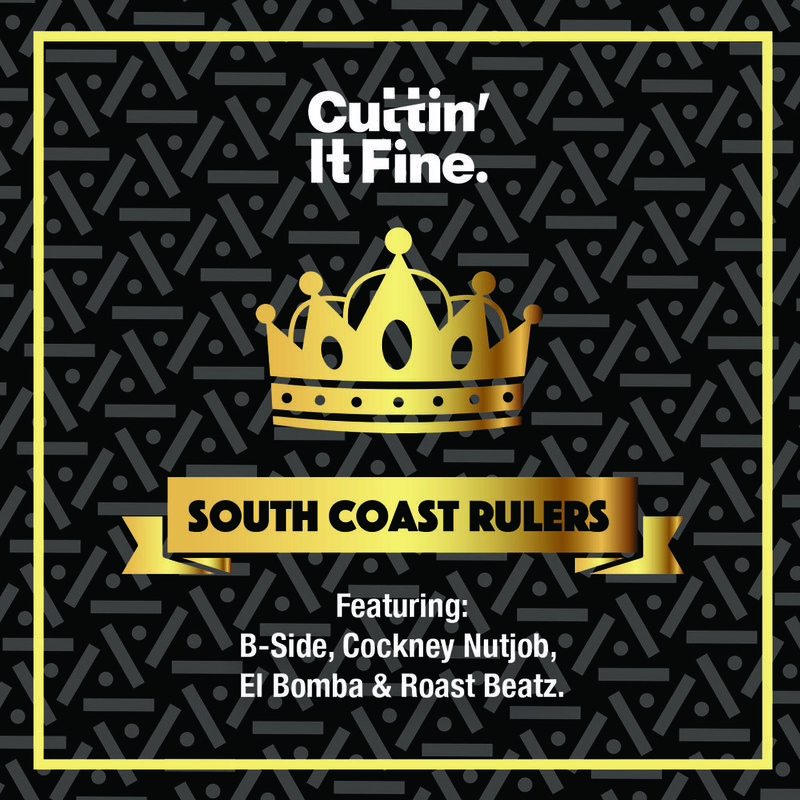 Each inject some much needed swagger into this 4 track EP to show you how they handle wrecking the party Southside! Read on for a more visual representation…. Let It Go is officially the feel good anthem for the most anticipated sunny season of the year. Gather round as we add the ingredients for an intoxicating summer punch to entice a packed dance floor, infectious head nodding and big smiles to match the vibes! We’ll pop the cork off a UK hip hop veteran, squeeze the juice of up and coming vocalist, shake up some dusty reggae breaks, top it up with tight scratches and rub the rim of the glass with a bass line warmer than the West Indies! Following on from Roast and MysDiggi’s number 1 single Pour Me, it was a no brainer for them to collaborate again on Mr Beatz new album. Keeping with the feel good, uptempo vibes where they left off, they have recruited the talented vocals of Ella Mae Sueref to create a track that will pick you up when your feeling down, entice you to move your feet and beam whether you’re at a festival or in your back garden. Remixes have come courtesy of TwoGood, BadBoe and Hipphopapotamus. Each sprinkle their vibe and flavour on this already scorching track. Taking the tempo and sample to different places which will satisfy any mood or dance floor.